Oh God I wanted to like this movie. Melissa McCarthy, Kristen Wiig, Kate McKinnon and Leslie Jones. Paul Feig directing. Seems like a formula for success. Only GHOSTBUSTERS does not work. I am going to try to avoid comparisons to the original film, but it is going to be difficult. Here goes. Kristen Wiig is Erin, a scientist about to get tenure at Columbia University. But a book she wrote years ago with her friend Abby (Melissa McCarthy) resurfaces and not only stops her tenure track, but forces Charle Dance to fire her (Tywin Lannister lives). Abby is working with Jillian (Kate McKinnon) at a diploma mill, trying to keep the paranormal dream alive. Erin confronts her about the book, but they wind up going to a creepy old New York mansion where they find a ghost. Eventually they meet up with Patty (Leslie Jones), an MTA worker who spots a spirit in the subway. The four women go off hunting and trapping ghosts until the Mayor (Andy Garcia) tells them to stop. But they can’t because a social outcast of a guy (Neil Casey) is trying to break the barrier between realms or something and bring the dead back to start the 4th Apocalypse (the first 3 were when?). There are proton packs, new devices and conflict with the government and a lot of pseudo scary ghosts. The problem is none of it makes a whit of sense. Yeah, it does not have to in the real world. It has to make sense in the world created on film. Other than being an outcast, why does Casey’s character do it? Some vague reference to restarting the world, but really it is never clearly explained. Leslie Jones’ character just quits her job and joins this band of Ghostbusters because she knows New York. They hire Chris Hemsworth as their secretary/receptionist for no apparent reason other than he’s beefcake. We learn Erin’s motivation for doing this, but Abby and Jillian? No clue. Characters flit in and out for no apparent reason. And the cameos, oh my. Bill Murray has a supporting role as a paranormal debunker. 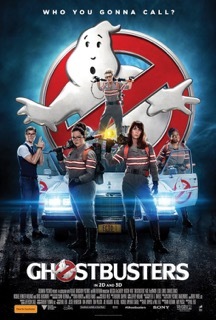 But Dan Ackroyd, Ernie Hudson, Sigourney Weaver and Annie Potts make quick appearances just so the audience can go, “oh wow, look who it is now”. Ackroyd’s cameo is particularly pointless. Then there are the meta references to the criticism the reboot received for casting women. Yeah, the points are correct, but completely out of place here. There is a running gag about Abby’s frustrations with Chinese takeout, but why? It has nothing to do with the story at all. The cast is fine. Wiig’s nervous nerdiness plays well. McCarthy’s character sort of works, but other than telling us she’s an expert and spewing a bunch of paranormal science terms she’s marginally credible. Jones plays an outsized version of herself. She is one of the funniest people on the planet and she is really funny here, but it is not much of a stretch. McKinnon’s weirdness plays the best. She’s the inventor of the group, coming up with all the gadgets and ghost catching equipment. It’s like a nutty professor on steroids, or amphetamines. Other than the four stars, there is a lot of talent in supporting roles. Most of it is wasted. Cecily Strong is decent as an uptight assistant to the Mayor. But Zach Woods, Toby Huss, Ed Begley, Jr., Matt Walsh, Michael Kenneth Williams all have such fleeting appearances. They are all underused for such distinctive talents. And the music. They start the film with the beginning of Ray Parker, Jr.’s hit but we never hear the full song. Maybe they didn’t want to pay Huey Lewis royalties. But about 4 different artists reinterpret the song. It’s just annoying. Here’s my issue. Either completely embrace the original and do this as an updated version of that storyline or completely cut ties, meaning no cameos from the original cast that make us yearn for that version. Feig does neither and the middle ground is not good. Look, GHOSTBUSTERS is a perfectly satisfactory movie. But it could have been so much better.